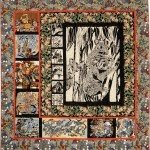 Missed out on the numerous recent quilt shows , but free this weekend? Over 180 Quilts on show, including mini Challenge Quilts created by Quilters from pre-school age to Adults. Fittingly, the Challenge topic is "10" and there will be prizes awarded in all age groups. In the general exhibition there are fantastic Junior entries to see, as well as quilts from such well known quilters as Caroline Sharkey, Linda Steele, Deborah Louie and Julie Haddrick. Visit the Craft Stalls and relax at the Quilt Show Cafe, knowing that all proceeds will benefit the P&C Fundraiser for Berry Public School. Please support and enjoy, this popular Quilt Show! Jane Gibson presents Friday showcase at the Guild office at 10am on Friday, 4 May 2012. The entry fee is $5 entry for members and $10 for non members. .....The Sydney Quilt Show... is the Annual Dinner. .............fruit /cheeses / tea & coffee / after dinner mints. Theme : The Most Unique use of Pearls.. Prizes for unique and adventurous usage! We are privileged to have Beth Miller as our Guest Speaker at the Exhibition Dinner. Beth is an accredited quilt teacher and a well renowned Quilt maker from Canberra. She is well known both nationally and internationally, and has exhibited her quilts in the USA, France, New Zealand, Holland, Tripoli, Cairo, Damascus, Aleppo, Kuwait and throughout Australia. Beth has won many prizes for her work over the years and last year won 1st place and The Judges Choice in the 'Mixed Techniques -Professional' section for Vessels 1 at The Sydney Quilt Show. This Function will be very special indeed, as the Guild's 30 years of history is acknowledged, reflected upon and celebrated. Looking forward to seeing you all.... in your Pearls! Deborah Laurie and her trusty 'Maids Of Honour' have been hard at work collating all the details of this year's 30th Anniversary entries. All secrets are remaining 'veiled' until 13 June, however, and as with most Volunteer gigs, helping - out is always 'married' with delightful rewards. Can you volunteer please, at this year's Sydney Quilt Show? All assistance will be gratefully received and rewarded with friendship, a Volunteer Quilt Show Badge and a Catalogue. * Nothing to stop a few Pearly People turning up at The Exhibition Dinner, however. Please Note that the July and September meetings of QSG of NSW will also be held at the above venue. 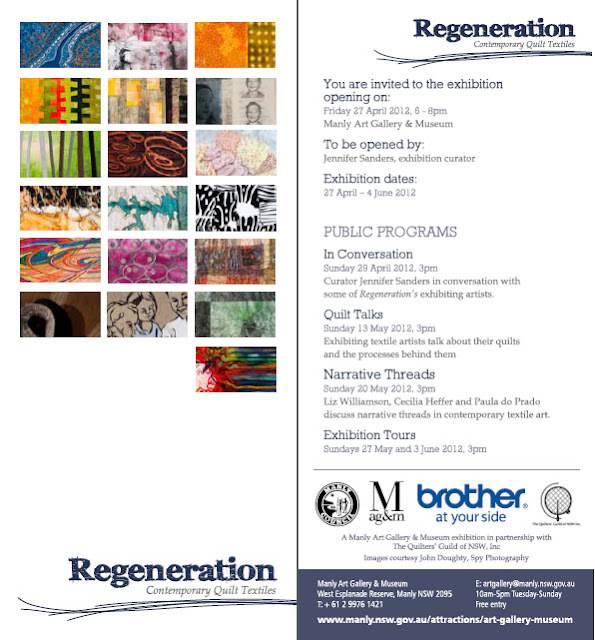 Don;t miss the official opening of the Regeneration Contemporary Quilt Textiles Exhibition on Friday evening, 27 April 2012 at 6pm. Join fellow NSW Quilters' Guild Members in admiring and celebrating the creative journey of some of our accomplished quilt artists as they explore the theme of regeneration. Manly Art Gallery and Museum...... until 4 June 2012. See this link for more information and advance images of some of the work. Unfortunately there has been significant storm damage to the venue. If you can't come to the Burwood General Meeting on Saturday 19 May, then please think about posting some of these blocks, to reach the Guild Office by Tues 15 May. The lonely little petunias (above) are currently in The Guild Office and would love some fabric friends to join them! She started teaching when one of her local patchwork shop owners noticed her work. From 2006 teaching her own quilt designs has become her full time income. ‘My main interest now focuses on reproduction fabrics from the second half of the nineteenth century and I make quilts that (hopefully) look old. I am in the process of collecting a library of books dedicated to quilt history and I love to surf the net reading about others who work in this genre. There are now quite a few websites of Museums and Quilt Study Groups which publish photographs of antique quilts. Antique quilt dealers are also a good source of visual stimulus for antique designs. A lot of quilters, including myself, are writing their own blogs to keep the public up to date on their latest endeavours’. ‘That photograph of that quilt haunted my thoughts for a long time! I had to make my own interpretation of it….This quilt has been the subject of an article in The Journal of the British Quilt Study Group, Issue 10, 2009. The article by Bridget Long called “Sibling, Cousin or Friend?” compares the coverlet that I loved from the British Quilt Heritage Project with another very similar fragmentary coverlet now in a private collection in the United Kingdom’. And the quilt she made was ‘Pemberley’. It is an interpretation of an old quilt, but designed with more symmetry in the components, simplified borders and a different centre to the original. Because she loves English Frame quilts so much, Katrina then continued the Jane Austen series by working several of her favourite shapes into the framework of borders on her ‘Netherfield’ quilt. Katrina described in detail the process she followed to come up with the final design and inspired fabric choice for this quilt. The third in the series, ‘Longbourne’, went through the same process of design and fabric selection. It was inspired by Elizabethan crewel wool embroidery centres and Lucy Boston’s favourite shapes used for paper piecing. We were privileged to see the fourth in the series, ‘Rosings’, which has just been on show with the three earlier quilts in the series. 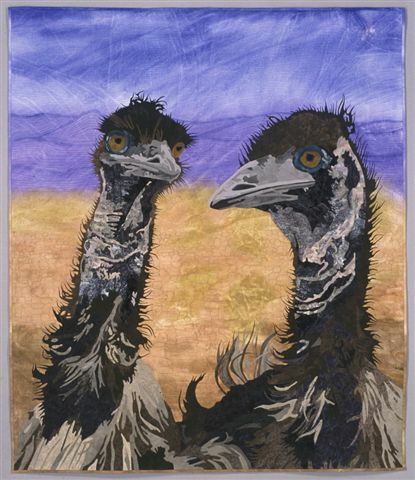 They were displayed this month in Melbourne at the Australasian Quilt Convention and it ‘Rosings’ is Katrina’s entry in the Sydney Quilt Show this year. She reminded us that there are 3 other houses mentioned in Jane Austen’s books if she wants to continue with her ‘obsession’! To finish we saw eight of Katrina’s other quilts that show her continued love of reproduction fabrics. And she had also brought along some of her students’ quilts for us to admire and examine. Bring along your sewing kit for hand applique or piecing; or, perhaps you enjoy machining: the sewing machine in the office is always available for use. Please join us in a fun day as we gather to create quilts for needy children and their families. Bring some lunch if intending to stay the day. Regeneration: Contemporary Quilt Textiles 2012 will be open free to the public from 27 April to 4 June 2012 at the Manly Art Gallery & Museum at West Esplanade Reserve, Manly. All are invited to the opening by the curator, Jennifer Sanders, at 6-8pm, Friday 27 April 2012. The exhibition showcases some of the best work to be seen in the art quilt world. It will be an opportunity, not only see the finished artwork, but in most cases, to also see the processes used by the artists to achieve their vision and response to the theme ‘Regeneration’, via individual display boxes. This will include the artists’ sources of inspiration, photos, sketches, samples of fabrics and techniques. Congratulations to the successful artists: Jody Abel (VIC), Mirjam Aigner (NSW), Anna Brown (NSW), Jan Clark (NSW), Sue Cunningham (VIC), Amanda Daly (NSW), Ruth de Vos (WA), Dianne Firth (ACT), Brenda Gael Smith (NSW), Judy Hooworth (NSW), Alison Levingston (NSW), Gloria Muddle (NSW), Alison Muir (NSW), Judy Nikoleski (NSW), Kylie Ramsay (NSW), Greg Somerville (NSW), Joanne Steele (NSW), Carolyn Sullivan (NSW), Antonia Valentine (NSW). There is a full exhibition program including, on Sunday 29 April 2012 at 3pm, In Conversation will be held at the Gallery, with Jennifer Sanders, who will discuss the exhibition and artworks with exhibiting artists - Judy Hooworth, Dianne Firth, Alison Muir, Judy Nikoleski, Jo Steele, Jody Abel, Mirjam Aigner, Amanda Daly, Alison Levingston, Kylie Ramsay and Antonia Valentine. Do you know a young quilter who might like information about the following competition? Do you live near a school and can send a copy of this competition to a teacher in charge of a Textiles Dept? Do you have friends interstate, who know of young quilters that may not have seen this notice? Do you have a Quilt blog and can advertise this Special Quilt Competition? Please spread the word.......and encourage tomorrow's notable Quilters, with this years generous competition. 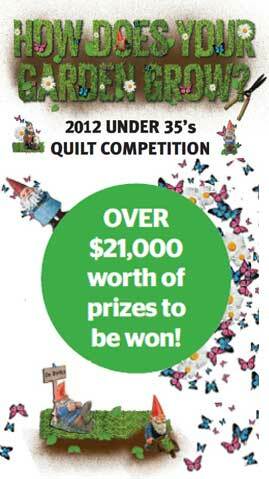 To celebrate the Guild's 30th anniversary, Quilters Companion and Brother International (Aust) Pty Ltd are proudly sponsoring the 2012 Under 35's Quilt Competition How Does Your Garden Grow. Be inspired by the theme to create a quilt no larger than 120 cm X 150 cm (portrait or landscape orientation). Categories: Primary students, Secondary students, 18- 24 years, and 25–35 years. EVERY entrant will receive a free digital magazine subscription for Quilters Companion and Homespun Magazines and Quilters Companion 2013 Diary. Entries close 12 September 2012. All quilts will be exhibited in September 2012 in Sydney. For further information contact the Guild President. Have you entered a quilt for the upcoming Sydney Quilt Show and still need to sew on that label / hanging sleeve or stitch up the binding? Exhibition Secretary Deborah Laurie, has announced that ALL entries have been accepted, with acceptance letters being mailed approx. May 1st. There are 49 days left to lick those needles* and smooth those seams! *.... another "Pearls of Wisdom"...some quilters suggest that whilst threading a needle, it is more productive to lick the needle, rather than the thread. The Australasian Quilt Convention 2012 Gala Dinner in Melbourne on Saturday evening, was abuzz with great excitement when NSW Quilters' Guild members 'scooped the pool' during the Awards presentation. The National Quilt Award is presented to the maker of the quilt that is judged the best from the 'Best of Show Quilts' from the annual state guild shows around the country in the previous 12 months. Merelyn is an outstanding recipient of this prestigious award and all Guild Members will be thrilled for her. Not only is she extremely talented, but also graciously devoted several hours as a 'white glove lady' on Saturday, answering the many questions that viewing this amazing quilt provokes. Congratulations Merelyn! The Rajah Award is presented to a quilter who has made an outstanding contribution as an individual to quilting in Australia. The 2012 recipient is Judy Hooworth. Judy, her contemporary quilts and designs, and constant enthusiasm has been a big influence on many an Australian Quilter. Well done Judy! The Lut-Da Award rewards a quilter who has used their quilting skills and knowledge to selflessly contribute to others in their local environment or quilting community. This year, the 2012 award went to Isobel Lancashire. Isobel is indeed an extremely worthy recipient of this Award, as many of the NSW Guild members would acknowledge and is to be warmly Congratulated! who has very deservedly won the 2012 Shining Light Award. The recipient of this accolade must be under 18 years of age and it is given to provide further encouragement in their quilting journey. Ineka is extremely prolific already and all members will enjoy watching her mature as a quilter in the future. Congratulations! Fellow NSW Quilters' Guild Members are extremely fortunate to have such creative and skilful quilters within our midst. Many sincere Congratulations to these 2012 Award winning quilters! This exhibition will be a celebration of a life beautifully lived and will give thanks for the support provided by Breast Cancer Network Australia. Kay was a prolific quilter and her large number of beautiful pieces reflect the joy she received in creating them, with her eye for colour, texture and design. Quilts made with love for her family and friends will be exhibited in April, with all proceeds to be donated to Breast Cancer Network Australia (BCNA). 144 Victoria Street, Ashfield NSW. The Fairholme Quilters' Quilt Show is being held again next weekend. This exhibition of members quilts, being supported by Hornsby Shire Council, will feature 2 beautiful Queen sized Raffle Quilts. Along with quilts, there will be a 'Handmade' Crafts Stall, Merchant Booths and a delicious refreshments area. Venue: Thornleigh Community Centre, Phyllis Avenue , Thornleigh. Entry Fee: $6.00 adults, $5.00 Concession and Children under 12, free. 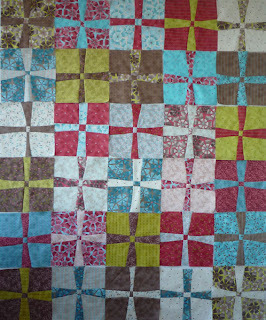 Join Brenda Gael Smith for a fresh look at a classic Patchwork motif - the "X" or Cross Block. Did your Mother, Grandmother, Aunt, other relative or friend teach you her sewing skills? Perhaps you remember a certain wonderful wise mantra of theirs, or maybe the advice of an early Quilting Teacher still rings in your head, each time you sit down to create. "Use Your Empty Time"....this gem of information, written in a 1991 Lady's Circle Patchwork Quilts, still resonates. It referred to having a "pick up and go bag" of pre-prepared handwork, thus turning those Dr's Waiting Room periods into patchwork time. Then there are the hours that soon add up for Mum's at School Gates. There's also travelling time: work / holiday or visiting, and even at home "Empty Time" can be found, with snatches of productive moments being grabbed between other duties. Using lengthier home quilting periods to prepare fabric and blocks, cutting out, threading needles, and updating the Grab Bag, will pay off ....... as you race out the door. To celebrate The Guild's 30th Anniversary, a collection of wise words, hints and tips that you've discovered have been helpful on your quilting journey, will be collated and published. Please send these helpful suggestions, with your name attached, to the Guild Office, or give them to Meg Orr at the General Meetings. We'd love to know your "Pearls"! 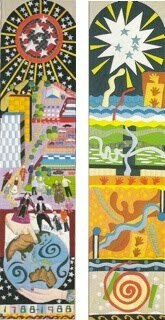 Willoughby Council has recently upgraded their premises in Chatswood, allowing the Arts and Cultural Manager, Jacky Talbot, to showcase The Bicentennial Banners; textiles that were designed and created in 1988. There are 14 visually stunning Banners, celebrating the History of Willoughby from its indigenous Guringai roots, through to the diverse community present in 1988. Judy has devised a guided tour of these banners, recently extensively conserved by The International Conservation Service. NSW Quilters' Guild members will once again delight in viewing the hard work of one of our long time members. Textile Artist Yvonne Line led an industrious team of volunteers throughout two years of dedication to bring to textural life, the vibrant designs of Malcolm King. These Bicentennial Banners are a supporting addition to the National Trust's Heritage Festival 14-26 April 2012. The banners are on view permanently, however the Information Tour is scheduled only on Tuesday 24 April. Please book for this tour, to hear the history of The Bicentennial Banners and how restoration was undertaken. Jacky Talbot would be delighted to hear from any of the original volunteers, or their families, who worked on this installation. Once again The Guild will have a presence at Sydney's Royal Easter Show. If you are visiting, then come and chat to fellow members who will be demonstrating sewing techniques in front of a great display of wonderful quilts.